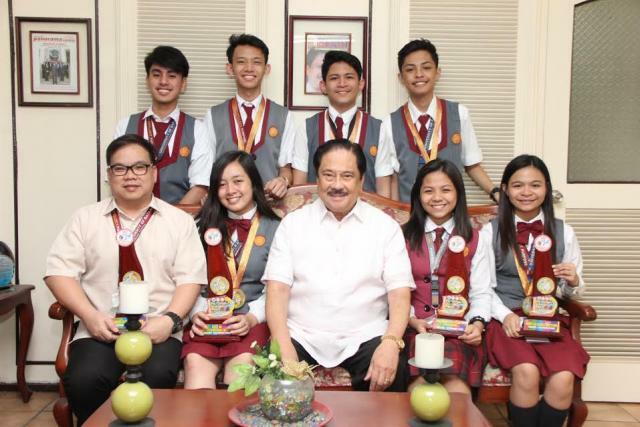 Tunog Pamantasan, the official student Publication- Filipino of High School Department proved again their prowess as they rank 7th and was awarded as one of the Best School Paper in the Philippines in the held National Schools Press Conference last January 22-27,2017 at Pagadian City, Zamboanga Del Sur. Attended by almost 7,000 campus journalists and school paper advisers in the Philippines, Tunog Pamantasan was one of the schools that outshined. The Filipino School Paper also raked the 2nd place in Pinakamahusay na Pag-aanyo ng Disenyo at Pahina and 5th Place in Pinakamahusay na Balita. Our staffers in the High School Department representing region CALABARZON also bagged 4th place in the Collaborative and Desktop Publishing (English), a 4-hour on the spot newspaper making. This was participated by 18 regions all over the country. Aeron Keil Lacsamana of G9-1 SHS, Shanelle Rae Lacsamana of G10-1 SHS, Hannah Paulene Dimaano of G10-1 SHS and Luis Gabriel Llagas of G10-1 SHS participated in the contest. To complete the roll of the students who participated, Aidan Jerome Andal of G10-1 SHS, Jun Daryl Albotra of G10-2 SHS and Ciara Abigale Cabello of G11- Aristotle also competed. The group took the Best Tropa Award in the Online Publishing Demonstration sponsored by X-Rappler, Move.ph and Talk and Text. Our staffers were accompanied, trained and coached by Mr. Julius Caezar Lepran, Ms.Rozsanet Portugal, advisers of the publication and the coordinator for publications, Dr. Redentor S. Rodriguez.